ActKnowledge has spent the past decade working to understand and make the case for how social change initiatives work. 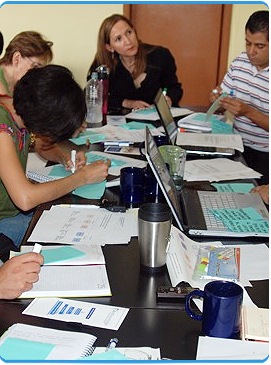 As leaders in the development and use of a core methodology know as “Theory of Change” for planning, participation, and evaluation, we work with organizations in a process that begins with an outcomes-based approach to program design, creates a detailed framework for decision-making and evaluation, and provides a practical tool for ongoing management and review. Our work spans a continuum from building the capacity of small organizations to clearly identify and track their goals to multi-site, longitudinal research and evaluation. ActKnowledge works closely with staff and participants of foundations and non-profit organizations to understand their work and the context in which their work occurs. As environmental psychologists, we strive to capture the social, historical, political and spatial/physical environments in which problems are embedded and solutions are to be found. We are based at the Graduate Center of the City University of New York and are part of the Center for Human Environments, which allows us to benefit from the resources of the university while retaining our independence as a social enterprise. Our staff members have backgrounds in community development, social service provision, youth development, parks and public space, education, child welfare, urban housing, public health, collaborative initiatives and public policy. ActKnowledge is a social enterprise that connects social change practice with rigorous study of how and why initiatives work. ActKnowledge joins with community organizations, nonprofits, foundations, non-government organizations, and government in efforts to transform traditional institutions, public spaces, and the environment. Our approach to the on-the-ground work of social change comes from a strong base in social science research and theory. We see research and social change practice as parallel processes of knowledge production, each informing the other. Our expertise allows us to capture the results of social change endeavors through a systematic analysis that enables our partner organizations to refine and improve their tools and strategies. We also strive to apply the lessons learned to the broader field of action research for social change.